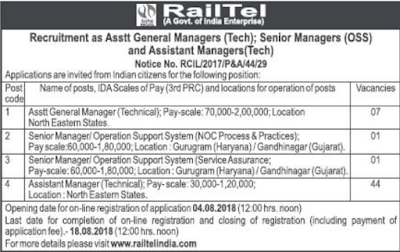 Railtel Corporation of India Recruitment 2018: Railtel Recruitment notice for the engagement of the contenders on 53 positions of Astt General Managers, Senior Managers/ Operation Support System and Assistant Manager have been published. Contenders possessing Graduate Degree or Post Graduate Degree can submit their online forms for Railtel Corporation of India Recruitment from 04-08-2018 to 18-08-2018. After the submission of forms for RCIL Vacancies, contenders have to participate in selection procedure. We the team members of www.privatejobshub.in have provided details regarding Railtel Corporation of India Recruitment 2018-19 Notice on this page for your comfort, so what are you waiting for? Go ahead and grab complete information soon. Graduate Degree or Post Graduate Degree holders are eligible to apply for Railtel Corporation of India Vacancies of Astt General Managers, Senior Managers/ Operation Support System and Assistant Manager. The minimum age of the contenders for Railtel Manager Jobs should not be below 18 years. The upper age and relaxation in age for the contenders belonging to SC/ ST and other reserved categories will be decided as per the norms. Selection of the contenders for Railtel Corporation of India Recruitment of Managers will be made through written examination and Interview. Final decision regarding selection will be of management panel of Railtel Corporation of India. Then, you need to press “Careers” link that is accessible at the top of the home page. Now a list of RCIL Recruitment Notifications will be shown at your computer screen. Read the complete Railtel Corporation of India Notification carefully and ensure requirements. Eligible candidates have to go for apply online and enter asked details in Railtel Online Application form. Upload documents if required and take a print out of RCIL Online Application Form 2018. Hit “Submit” tab and take a print out of Railtel Corporation of India Application Form for future purpose. Aspirants are suggested to visit to the Official Website of the organization for getting more knowledge related to Railtel Corporation of India Recruitment 2018-19. To grab more updates regarding the same or others, you have to be in touch with our portal by subscribing our free email service. what about the exam dates ?? ?